13 for 2013 - March Finished! 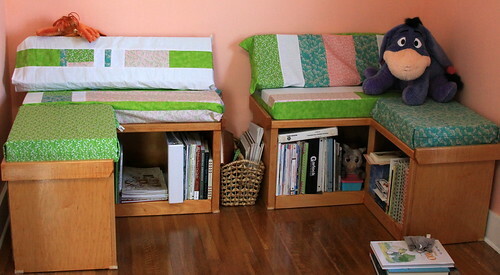 In my previous post, I already covered the other March projects, stating that I had the cushions to cover in my craft room seating area. Even although I still have to finish a lot of the closures and sew on snaps and things, I'm counting them done! I have mixed feelings about them because I rushed and they aren't as put together as I would have liked. On the other hand, I love the variety and the colors and am very glad that I was able to use up some extra stash fabric that has been waiting for a lovely use. Yes, those walls are peach. I don't know why, they just had to be. 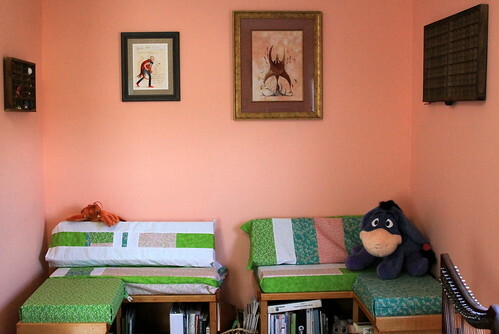 Peach is the color the room told me it wanted to be. So, I listened, and I really do love it. The room is also really hard to photograph. It has three windows so is either washed out or too shadowy depending on where the sun is in the sky at the moment of picture taking. 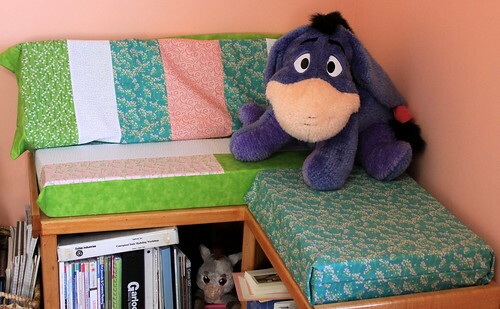 Here's Eeyore. He sits on the right. The blue cover here was the first one I did. It has an invisible zipper closure and really fits snugly. This was actually the first fabric I picked out for cushions and the piece that it was built around. Here's Fury on the left side of the seating area. Here you really can see all my closure issues. 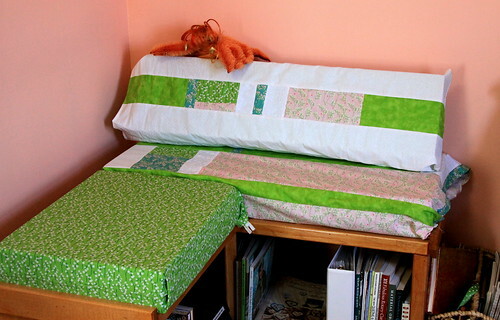 The invisible zipper on the green cushion is visible, the back bottom cushion cover isn't quite long enough to fasten and the back pillow has more of a pillow case on it. Above Fury is my other phoenix artwork, done by Sophie Blackall for her Missed Connections series of artwork. I just love it! A full shot for the complete effect, of course! This picture tells me that I really need to cull through my crafting books and tune my harp. What it doesn't tell all of *you* though is how incredibly comfy it is and how excited I am to actually have a place to sit, stitch, read, crochet, sketch, and create. Mary has been part of the LJ community for a long time and has participated in quite a few swaps. Probably one of the closest people to me geographically - I'm hoping to do a quilting weekend soon with her! 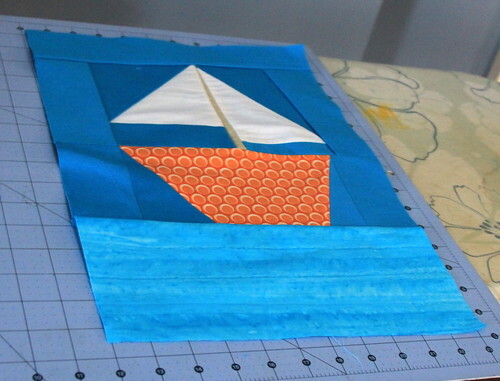 Mary blogs over at Quilty Mary Sews and Quilts. I'm still waiting to see pictures of the blocks she's accumulated so far! Next up is Nancy's block. It's a card trick block, easy. You'd think. 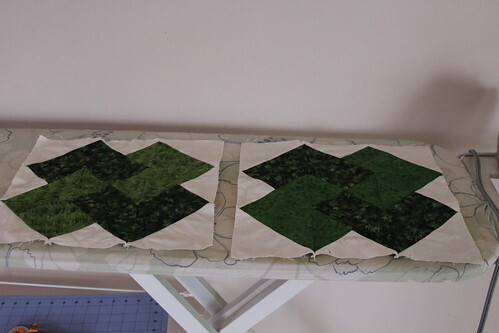 I had to make 2 because my scant 1/4" seam was off and the piecing wasn't up to my standards, so hopefully she can use two blocks. 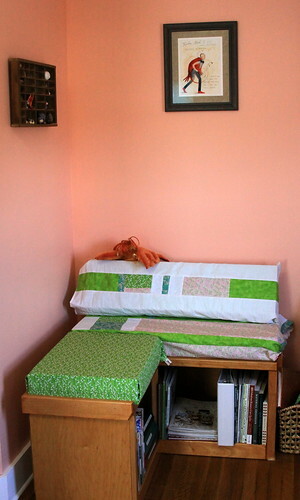 The other part of my March goals was to finish all the cushions for the seating in my craft room. As of this moment, I have 3/6 done. They're not done well because they're the thick foam and I've really been going as I tend to - which is sew along and make it work. I think when all is said and done I'll have 6 covers with 4 different types of closures, but, eh, who's going to see the closures? I can't wait to show them off when they're done! My Very Last 12 for 2012 Post - I Promise! 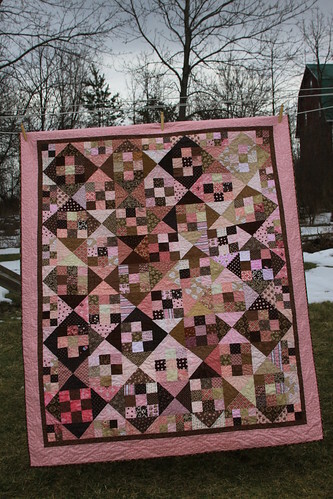 In addition to the last post about the Very Late Wedding Quilt, I had one more quilt that I had hoped to finish in 2012. This was started again in the Birthday Blocks swap over on LiveJournal. I had finished the top as part of the 12 for 2012 list, see this post. 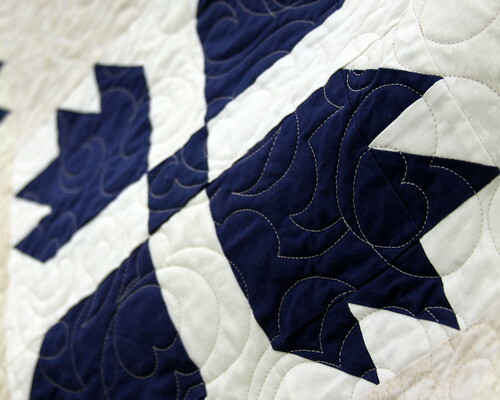 Although not in my colors at all, this quilt has certainly grown on me and is quickly becoming a favorite. I wish you only could see better the detail in the quilting that the woman who does my quilting for me managed with this pattern. You can kind of see it here. At least you can see it the best here, but it really is lovely. 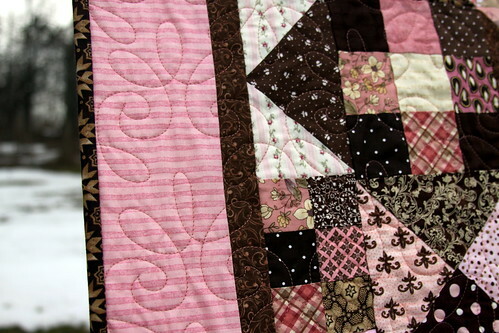 My goal for this quilt was scrappy. Although I've never been too proficient in the "scrappy" look - I think I nailed it with this one! And, of course, the back. Simple and done! A (Very) Late Wedding Present - The Quilt That Almost Wasn't! So, I've finally gifted the quilt that I finally buckled down and finished thanks to my lovely ladies who are a part of the LiveJournal Birthday Blocks Swap. So, I can finally show pictures! 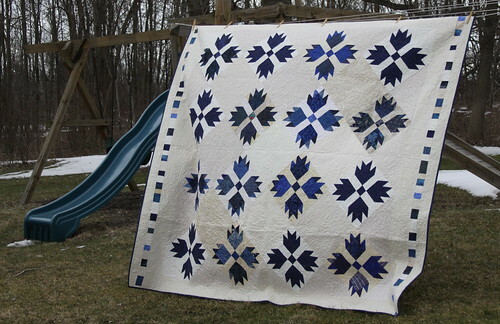 Now, I can also tell the story of the quilt that almost wasn't. It's kind of like I Don't Like My Child. After the engagement, and before the wedding, I made them the offer: I'll make you something for your wedding present. 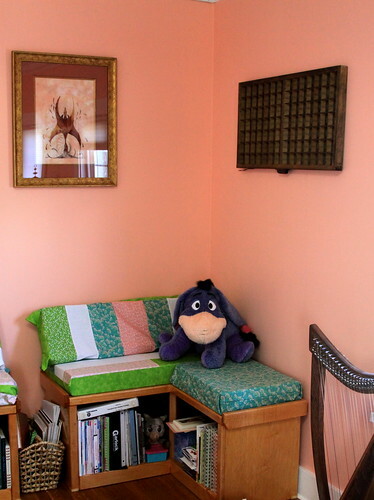 An afghan, a scrapbook page mounted on canvas that you can have to wall mount, a quilt, etc. I had picked out a handful of quilt patterns that I felt comfortable executing - they selected the traditional bear paw block. I asked for color, they picked cream and navy. I could work with that. Problem One: Or so I thought. 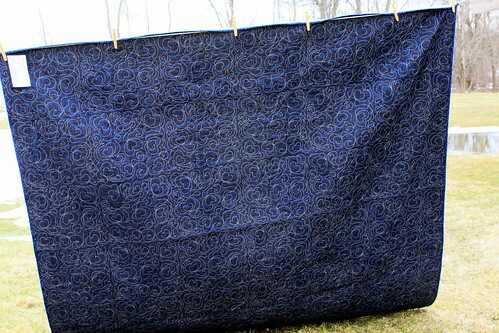 I eagerly got the fabric home and began. Over the course of the next year, I got half the blocks done. Then I hit a major roadblock. It was boring me to tears - no, not to tears, to nervous breakdown. Yeah, I know, sounds crazy, but I know my fellow crafters will back me up on this. You start to dread a project. 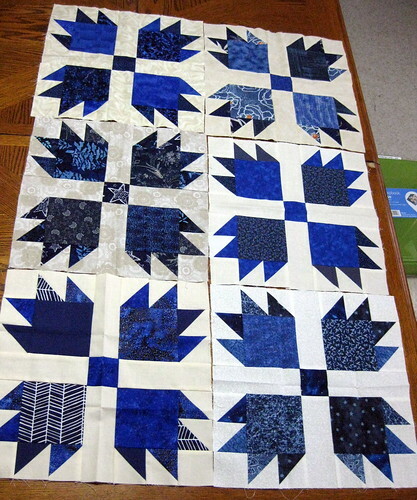 Early on, I had no clue why - I love the two of them - I owe Jeff a lot - it's an easy pattern - I like blue and cream. What the hell is wrong with me? A year in, I moved to the farmhouse in the country. It gets packed and stays packed. It gets unpacked and left on the floor. The fabric is wrinkled and the sight of all that cream and blue reduce me to tears. I look at it for another year. Until I can't take it anymore - this project has become my albatross. I add it to my 12 for 2012 list and resolve right there that I need help. So, I make a 16" Bear Paw block be my birthday block for the Birthday Block swap. I specify dark blue paws on a cream background. At this point, I have no clue what this will do for me - at the least, I'm hoping for inspiration. The blocks start coming in. I love them! I start playing with them and wait for the rest. When the rest arrive, I start playing with arrangement and realize that I have a new problem. 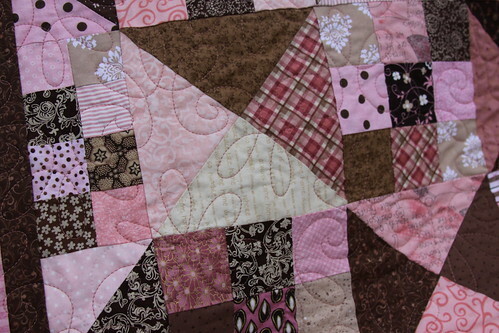 Problem Two - how do I make this one unified quilt with all our different cream backgrounds? Sorting through my stash, I start grabbing neutrals until I come up with something I like. Of course, I can't get too much further before I realize that I have a new problem. 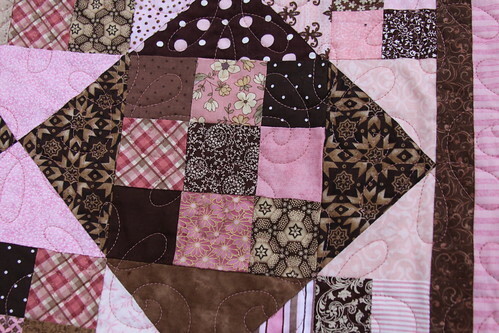 Problem Three: How to get a square quilt to be Queen-sized? I have some ideas, for sure. I could continue the on point theme, do a navy blue border around it and put four triangles on the corners to lengthen it out. I could just border it with cream, or blue and have long borders. Or ... piano keys! (Well, at least *my interpretation* of a piano key border.) But - before I start cutting - I take it to my lovely LFS - Patricia's Fabric House to get some feedback (and buy some backing - AND learn to buy binding and backing at the same time if you want it to be the same fabric!). Piano keys it is on the top and bottom, and fabric on the sides to bring it to Queen. 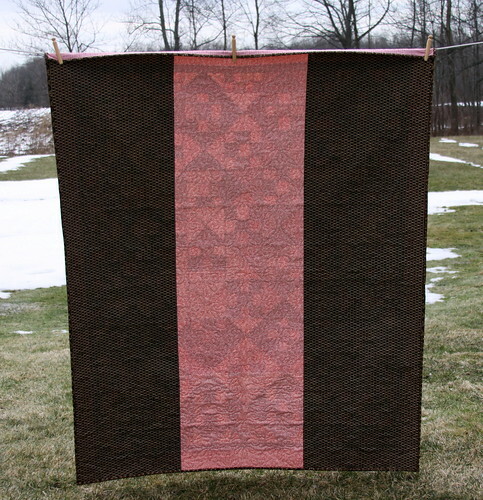 Make a sandwich and off to the quilter in the fall, back before the Holidays. Binding on and labeled in January. Finally gifted and warmly received. Don't you love those loopy hearts? I do. I think they are perfect for a wedding quilt. And one more shot of those loopy hearts because I love them so!